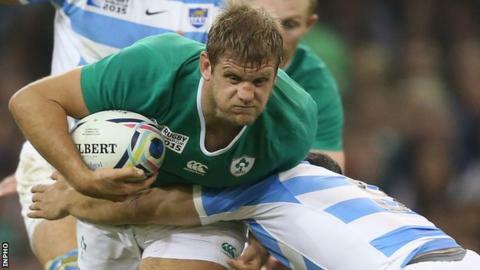 Ireland flanker Chris Henry's hopes of being selected for the summer tour of South Africa appear to have suffered a blow after he was left out of the squad for Sunday's training camp. Henry, who did not play in the Six Nations, is not among the 44 players who will meet up in county Meath. Tommy Bowe is missing as he continues his comeback from a serious knee injury, but Stuart Olding is included. The squad includes uncapped wing Matt Healy and centre Garry Ringrose. Henry, 31, has won 24 Ireland caps since making his debut against Australia in 2010. The Ulster back row regained his place in the Ireland squad for last autumn's World Cup after missing three months of the 2014-15 season with a heart problem. The emerging Ringrose, who plays for Leinster, trained with Ireland before the Six Nations but did not feature in the tournament. While Ringrose will attend Sunday's gathering at Johnstown House, Ulster centre Darren Cave, who was part of Ireland's World Cup squad, is not included. Healy has had a brilliant season with Pro12 title challengers Connacht and produced another superb display in last weekend's narrow European Challenge Cup quarter-final defeat by Grenoble. Leinster scrum-half Luke McGrath and Connacht's South Africa-born lock Quinn Roux are the other uncapped players who have been asked to attend the camp. Fit-again Ulster's Iain Henderson, who missed the Six Nations with injury, and Munster flanker Peter O'Mahony - still out of action because of knee ligament damage suffered at the World Cup - have also been included. Ireland face the Springboks in the first Test in Cape Town on 11 June, with the sides meeting again over the following two weekends in Johannesburg and Port Elizabeth. Backs: Keith Earls (Munster), Craig Gilroy (Ulster), Matt Healy (Connacht), Robbie Henshaw (Connacht), Paddy Jackson (Ulster), David Kearney (Leinster), Rob Kearney (Leinster), Ian Madigan (Leinster), Kieran Marmion (Connacht), Luke Marshall (Ulster), Stuart McCloskey (Ulster), Fergus McFadden (Leinster), Luke McGrath (Leinster), Conor Murray (Munster), Stuart Olding (Ulster), Jared Payne (Ulster), Eoin Reddan (Leinster), Garry Ringrose (Leinster), Johnny Sexton (Leinster), Andrew Trimble (Ulster), Simon Zebo (Munster).